Torbreck remains one of the great names of Australian wine, even though it has hit the headlines more than once for the wrong reasons. Founded in 1994, the business rose from the ashes after bankruptcy in 2002, only to see a further melt-down in 2013, sparked by the alleged behaviour of its founder and long-time figurehead, the outspoken and ebullient Dave Powell. A bitter dispute was played out on the pages of the wine – and eventually mainstream – press, as Powell was accused of squandering company money on some dubious business expenses running into hundreds of thousands of dollars. 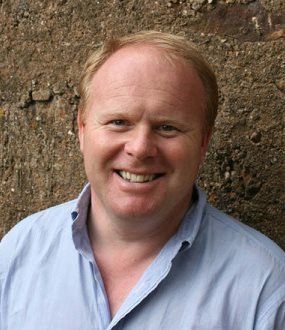 Powell moved on (and has recently launched his own new label ‘Powell & Son’) leaving owner, US businessman Pete Knight, to steady the Torbreck ship and re-focus on the wines and the towering reputation they had always enjoyed. The same winemaking team is in place at their Barrossa winery, and the range is undiminished, topping out with one of the southern hemisphere’s most expensive wines, The Laird, which sells for around £500 per bottle. Recently, Torbreck’s Marketing and Communications Manager was in Scotland and what a coincidence that was: he is Stuart Barrie (right), and old friend from Glasgow who had managed one of the city’s best wine shops for years before emigrating to Australia more than a decade ago. After a number of jobs working for top Australian wineries, Stuart came on board at Torbreck post-Dave Powell, and we caught up on his visit home to see friends and family (and to catch the Open Golf tournament at Troon). Naturally he brought along a broad selection of current releases for me to try, namely the 16 wines below. 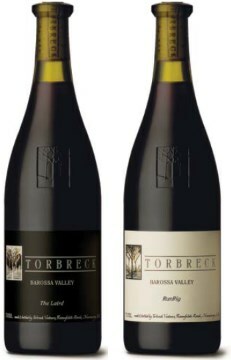 Based in the Barrossa Valley, Torbreck built its reputation on Rhône varieties, Shiraz of course, but also Mataro (Mourvèdre) and Grenache, and white varieties also follow a Rhônish theme with Viognier, Marsanne and Roussanne. Around one-third of fruit comes from their own vineyards, the remainder from across growers in the Barrossa which together gives access to some very old vine material, and some remarkable vineyards like Malcolm and Joylene Seppelt’s old Gnadenfrei vineyard in the sub-region of Marananga, that is the single source of fruit for The Laird. UK importer for Torbreck is Fells, assisted by Wine Importers in Scotland. (2016) This is a Marks & Spencer exclusive, made by Torbreck with input from M&S's winemaker Belinda Kleinig. At time of review the 2014 vintage is about to change over to this 2015 in stores and online. It's a really very good white Rhône blend, with all the creamy polish, succulence and weight of these varieties, plenty of pear, apricot and nuttiness in the background, but the full and substantial weight of the palate tempered by very good acidity, a leesy bite of richness and a lingering finish. (2016) A Grenache Mourvédre Shiraz blend from Torbreck, it is creamy, spicy and deeply red fruited, a little whisper of something meaty and peppery too. In the mouth the sweetness of the fruit is immense, though perhaps the acidity, alcohol and grippy tannins feel just a touch more astringent in the finish than I might hope for. (2016) More density to this then the 2014, more concetration with the spice and openness knocked back in favour of chocolaty, blueberry depth. A full, chewy density of the texture and spicy black fruit, tannins tighter and certainly one with more ageing potential. Note price and stockist is for the 2013 vintage at time of review. (2016) From younger vine fruit, but still 40-year-old vines. Lots of spice from open top ferment and then into older barrels of French oak, mostly larger hogsheads and puncheons, plus some big vats. Lots of cherry, blackberry and lighter rose-hip notes to match the spice and fruit depth. Very approachable. Price and stockist is for the 2013 vintage at time of review. (2016) An unoaked cuvée inspired by the Juveniles wine bar in Paris, there is normally around 20% Mataro in the blend, but a poor crop in 2014 reduced that to 7% along with 85% Grenache and 8% Shiraz. "The Idea is to make an energetic, youthful GSM blend," says Stuart. It is more fragrant than the Woodcutter's, with a real bright berry fruit, hints of chocolate and briar, and it has a touch of forest floor too. In the end it's that juicy, fresh berry flavour that pushes through against pert acids and tannins, and it is just delicious. Note price and stockist is for the 2012 vintage at time of review. (2016) A GMS blend (Grenache, Mataro and Shiraz) made in older French oak barrels from 100-year-old vine fruit. It is fabulously deep, with terrific mulberry and sweet clove depth, a sheen of vanilla and chocolate, and spicy black fruits flooding the palate. A lovely sense of effortless concentration and drinking beautifully. (2016) The Eden Valley provides 30% of the fruit for the Struie, coming from 36-year-old vines, blended with Barossa fruit that’s 80 years old. Fine lift and fragrance here, with some floral notes, a touch of violet and chocolate and the juiciness is there, with tight, tight tannins and good acids. A much more perfumed style, though without the substance of some. Note, not available in the UK at time of writing, so 2013 stockist quoted. (2016) This wine, made from a vineyard planted in the 1990s with cuttings from the RunRig vineyards, is aged in barrels that were used for last year's RunRig. A Shiraz/Viogner co-ferment. Absolute peachy Viognier presence here, with lots of perfume and the plush black fruit coming through. Big, chewy palate, lots of fruit concentration and black fruit skins, lots of extract and liquorice chewiness and density. Firm, firm tannins, and certainly needs time (when it's score might edge higher too). (2016) A wine from a cooler vintage, again a co-ferment with around 8% of Viognier joining the Shiraz. At 14 years old this still has immediacy of fruit but also all the smokiness, the bacon fat, the absolute purity of the fruit with raspberry and cherry freshness, with more chocolate and smokiness coming through and fabulous freshness on the palate, touches of herbs and sappiness seeing to that. Loads of fruit and still so enjoyable, I loved this wine for drinking now. (2016) All American oak for this bottling, which Stuart describes as “Our old school Barossa Shiraz.” About 40% of the oak is new and this is loaded with spice and meatiness, loads of leather and richness, but there is savouriness here, it’s not stewed or dead. Terrific depth and opulence on the palate as more of that leather and smoky bacon character wraps around the black fruit, It is full and long, and a superb example of the uniquely Barossa style. (2016) From a vineyard planted in 1927 and knows as the 'Old Quarry block.' This is 100% Mataro (Mourvèdre) and is highly aromatic again, a beautiful lift to this, so much floral character and the creaminess of the all-new French oak, but there’s a little meatiness, and fine mid-palate density and texture. It has a graininess to the tannins, good keen acidity, but long spicy length too. Not showing UK retail availability at time of review: contact importer Fells. (2016) Just released and at time of review only available in-bond, the 2013 Runrig comes from the Hillside vineyards as always are the backbone, six plots along the Barossa hills, all dry farmed. Made in open-top fermenters then aged in French oak, around 40-50% new. Each vineyard is vinified separately and then assembled and blended with a touch of Viognier in most vintages – usually only around 1 to 1.5%. Fabulous nose here, just so much creamy black fruit, but always agile and lifted, with violet and floral notes, liquorice and graphite. There is huge intensity on the mid-palate, real depth of fruit and plushness, silky tannin structure and tightening acid freshness. Pretty fabulous already, but clearly with potential to cellar. (2016) Thirty months in oak (50% new) for this 2012 where Shiraz made 98.5% of the blend. It adds a bit of sizzling bacon fat and meaty development over the 2013, but that is layered onto the plush black fruit, so much plushness and depth, and still little floral glimpses. A really firm core of tannins and acids, but all about the balance, the juiciness, a vital cherry skin edge of tannin and acid, and long and pure in the finish. Just delicious again and will age for decades I guess. (2016) This has a creaminess, a plushness and, yes, a touch of volatility, but that gives a soulful meatiness and meat stock character as well as delicious plushness. The wine spent 30 months in 70% new French Oak, and the small (3%) co-fermented Viognier component adds a touch of nectarine and peachy finesse which brings such a lovely dimension to this beautifully mature example. Lovely stuff. (2016) The Eden Valley component, with its cooler nights, once again gives lift and perfume to what is Torbreck's biggest selling wine in the restaurant trade. “We can’t make enough of this wine,” says Stuart. A nice black fruit lift, with tight blackcurranty aromas, and intense liquorice and black-berry fruitiness, taut with a sheen of smoke, but lovely balance again with the tight tannins and good, fresh juicy acidity. Available by the case of six in-bond at time of review.